Discussion in 'Femmes' started by mariemaud, Apr 19, 2009. We were immediately smitten by her cuteness and the intensity/drama we saw in her pictures. A few tests were enough to fall in love and Elite NY strikes back on our page with another of our favorite new faces (after Diandra earlier this year). No wonder she leaves us this strong feeling of drama as she actually enjoys drama or swimming in her life outside modeling and is also a trained ballerina. Still quite young and at school, our 5'8''5 NY girl is building a serious portfolio right now and the two examples above can tell it better than words actually. 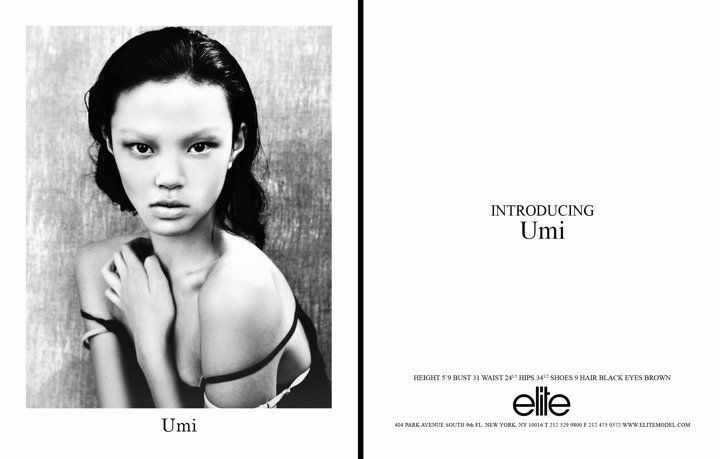 Meet Umi, with letters or pictures. She looks stunning. Can't wait to see more of her. Umi is stunning. I love, love & love her new pictures. Àren't they from Jonathan Leder ? She's only 13 ? The girl is showing a lot potential, I like her. she's so cute! Just came across her on the elite website. Didn't know she was signed that long ago. She's stunning, but very young. Hopefully that means a few more years of development before hitting the shows with a bam! I don't think it's a big deal but it's still a nice update.